Like most kids I know, I was a HUGE fan of Jacqueline Wilson's books when I was at school. I have lost count of how many I have read - probably several dozen. So I am really happy to let you know about this event which is sure to be very popular, just like her stories. 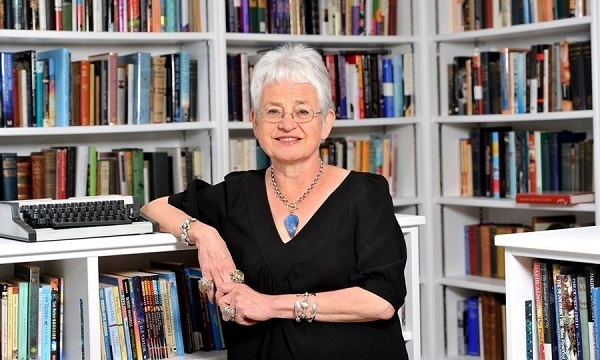 The Museum of London Docklands will be hosting a special talk plus Question and Answer session with renowned children's author Jacqueline Wilson on Saturday 10 May from 3pm to 4pm. As one of the UK's most well-known and much-loved writers of stories for children, Jacqueline Wilson needs no introduction. She has written more than 100 books since 1969, and some of her characters, like Tracy Beaker, have become television hits after being adapted from her novels. Jacqueline will be discussing Wave Me Goodbye, her first novel set during World War Two. The story follows ten-year-old Shirley, an East End girl who is evacuated from London to the countryside at the outbreak of the war. Shirley finds herself living a very different life with the reclusive Mrs. Waverley. After Jacqueline's 45-minute talk, there will be an opportunity to ask Jacqueline questions, and if you're lucky, she may even sign copies of the book for audience members. The new paperback edition of Wave Me Goodbye will be available to purchase on the day, as well as other Jacqueline Wilson books and merchandise. While you are at the museum, after Jacqueline's talk, why not continue your visit with a trip to the free Docklands at War gallery? London's docks were the heart of the capital, as ships from the Empire delivered vital rations for the population. This meant that the area was targeted right from the beginning of the Blitz. Hear stories of families like the one Shirley came from, and how they coped with the dangers of the wartime docklands. Whether you take cover in a small Consol shelter, or get up close to an unexploded bomb's shell, you can really explore what these families went through within this gallery. When you leave the museum, you'll be perfectly prepared to read Wave Me Goodbye. This event is free, but due to high demand, a ticket will be required. To register your interest and receive a notification of when tickets become available, please click here.